A World War Two pillbox, located at the front of sand dunes. It has probably slumped from its original position and is probably the pillbox that is recorded as NHER 32396. May to November 2004. Norfolk Rapid Coastal Survey. Context 7. Located at the front of sand dunes. 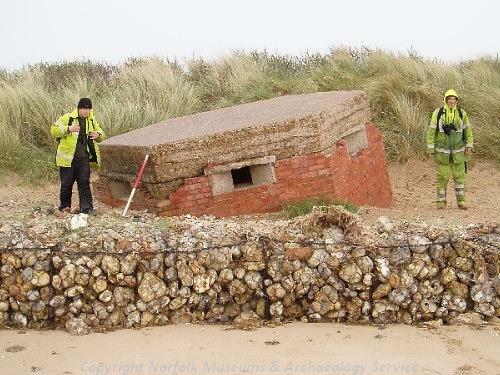 World War Two pillbox, possibly slumped from its original position. Probably a type 22 pillbox. J. Allen (NLA), 14 April 2005. This is probably the pillbox recorded as NHER 32396. As NHER 32396 is located about 260m to the southwest, it is probable that the grid references recorded in 1992 are incorrect (it is very difficult to accurately locate sites on this stretch of coastline without use of Global Positioning Satellites). In 2004 a line of gabions stood in front/seaward of the pillbox. D. Robertson (NLA), 10 April 2006. NHER 41426 is the correct location for this building and not NHER 32396. No change to description. E. Rose (NLA), 2 October 2006. --- Unpublished Document: NAU. 2004. Norfolk Rapid Coastal Zone Assessment Survey Context Sheet. <S1> Unpublished Document: Robertson, D., Crawley, P., Barker, A., and Whitmore, S.. 2005. NAU Report No. 1045. Norfolk Rapid Coastal Zone Archaeological Survey. Assessment Report and Updated Project Design..